"You are cordially invited to attend..." began an invitation to a formal dance I went to recently. It was beautifully printed, and went on to describe the elegant and enjoyable evening I was going to have. I accepted. And the invitation was correct. I did indeed enjoy it. A simple dance or party invitation is easy for us to understand. But many people today do not understand how God invites — calls — those He wants into His Church. They do not understand the Christian calling. That is, they do not understand whom God calls, or how, or why. Such a lack of understanding is saddening, for those God now makes the heirs to salvation are commanded to "walk worthy" of their calling (Ephesians 4:1), and to make their calling "sure" (II Peter 1:10). How can we do this if we don't even understand what our calling is? Yet we need not remain in darkness about this vital and foundational subject. The Bible teaching is plain. When God calls a person, He invites him into His Church to help the Church perform its great commission of preaching the Gospel to the world (Matthew 24:14), and to prepare to rule with Jesus Christ and teach God's way in the world tomorrow (Revelation 2:26-27, 3:21). That is the main purpose for being called now. A person called at this time is also one of the relatively few to whom God is now offering the chance for salvation. God alone decides who shall be called, by opening a person's mind to understand His truth. Most professing Christians feel that God is now calling everybody to salvation. Others think that God calls to salvation those who wish to be called, or those who seek to be called by deciding to "give their hearts to the Lord." Still others feel God must surely call only the best society has to offer — the "good people" who try to obey God as they see Him. A few feel that a person has not been called unless he has had some type of special religious experience such as "speaking in tongues." Certain preachers must feel that they have the power to call people, since they tell people at tent meetings to come forward and profess Christ. Amazingly, all these common teachings and impressions are proven false by the Bible. Although many people use the biblical expression and profess to having been "called" (e.g., "It has been two years since I was called to the Lord"), few have ever stopped to realize and understand what they are saying. The New Testament was written in Greek, and the English is only a translation. Nonetheless the English word call well reflects the process described in the Bible. To be called is to be invited or hailed by God, much as a person might telephone a group of friends and invite them to a party. Notice the illustration in Matthew 22:1-14. "The kingdom of heaven," Christ said in a parable," is like a certain king who arranged a marriage for his son, and sent out his servants to call those who were invited to the wedding" (verses 2-3). Quite plainly, then, God's calling is an invitation. Galatians 1:6 says it is a calling — an invitation — to the grace of Christ. I Peter 2:9 says it is a calling from darkness to light. Briefly, being called means that one is invited to be a member of God's Church, with all the responsibilities that entails and the hope of salvation. The Greek word translated "church" in the New Testament is ecclesia, which literally means "called-out ones." Hence when we are called we become part of the "called-out ones" — that is, the Church. And here another important point must be stressed: The common teaching that God is calling all now — that is, that He is now trying to save the world — is utterly false. When asked by His disciples why He spoke in riddles, Christ said, "Because it has been given to you to know the mysteries of the kingdom of heaven, but to them it has not been given" (Matthew 13:11). That is, the disciples had been called to know the truth, but others had not been so called. This is not to say that the others will never be called, just that they will not be called in this era or this lifetime. Those who are called now — a relative few — are called to help preach the Gospel as a witness (Matthew 24:14) and to prepare to be teachers and rulers in the world tomorrow under Christ, when God will begin to call humanity as a whole (Revelation 5:10). The subject of the time of one's calling concerns the doctrine of eternal judgment. 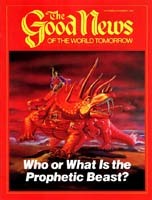 For more information, request our free reprint article "Is This the Only Day of Salvation?" We have seen that God's calling is, in part, an invitation to salvation now with His Church. And we have also seen that not all are being called now. But, then, who are now being called? Christ makes the answer clear in John 6:44. Here, surely to the astonishment of the religious teachers of this world, Christ states, "No one can come to Me [that is, no one is invited or called] unless the Father who sent Me draws him." No one can be called unless God Himself decides to call him or her. Astoundingly, this means that God does not call everyone — not those who wish to be, nor those who try to be, nor those who are talked into joining churches by well-intentioned but misguided preachers, nor just the "good" among people. Rather, He calls those He decides to call for His own reasons. Notice how Paul states it in Romans 9, where he discusses this precise topic: "So then it [one's calling] is not of him who wills [he who wants to be called], nor of him who runs [he who even tries in his own way], but of God who shows mercy" (verse 16). Paul is not saying those not now called will not be saved, only that their chance for salvation is not in this age, but later. Still, we cannot help but wonder upon what God bases His decision to call or not to call a certain person. God does state certain qualifications, and gives some examples from which we can glean answers. The most poignant of scriptures on this question is I Corinthians 1:26-31, where Paul writes: "For you see your calling, brethren... God has chosen the foolish things of the world to put to shame the wise, and God has chosen the weak things of the world to put to shame the things which are mighty; and the base things... and the things which are despised... and the things which are not." Literally, then, God picks those who are foolish, weak and despised — in the eyes of this world, that is. He does so in order that those who are saved are humble and don't take the credit themselves. He does it so all can see that if God is able to save the weak now, He must surely be able to save the strong later. To be sure, God looks for other qualifications as well — such as the natural abilities He wants for certain future jobs, and a willing attitude. Hence we see how Joseph and Moses and David and many others were used by God in accord with their natural abilities, and will fill places in His Kingdom that will utilize the same abilities. Probably one of the most important questions asked by those who consider this topic is "Am I being called by God — how do I know?" Notice John 10:1-28. In these verses Christ likens the true believers to sheep, with Himself as the shepherd. He says the true sheep will know their spiritual shepherd because they will hear His voice and understand His words. See especially verses 3-6, 14, 26-28. The point of the analogy is this: One whom God is calling will have his mind opened to understand when he hears God's truth. One who is not being called may hear the words, but, like a foreign language he does not understand, those words will not be mixed with understanding and belief. God calls, then, by opening one's mind to understand and believe the truth when he or she hears it. Are you being called? You are if you are understanding and believing the truth. Such is the clear meaning of many verses, such as Isaiah 6:9-10, Acts 28:23-27 and Romans 11:8-10. Of course, once God has opened the mind of a person to understand spiritual knowledge, He must bring that person into contact with the truth so he or she may hear the call. This topic IS so fundamental and pierces through so many commonly held wrong beliefs that it is important to highlight a few important verses one may remember or mark in one's Bible: II Peter 1:10 — Christians are commanded to make their calling and election sure. Matthew 22:1-14 — God's calling is His invitation to become part of His work and prepare for salvation now. John 6:44 — no one is called unless God initiates the call. John 10:1-28 and Matthew 13:10-17 — God calls by opening our minds to understand the truth, and those not called are spiritually blinded. Yes, it can be an enjoyable thing to be invited to a social gathering or party. But it is joy unspeakable to be among the few now invited — called — by God to fulfill the great commission and qualify for salvation and eternal life as children of God.